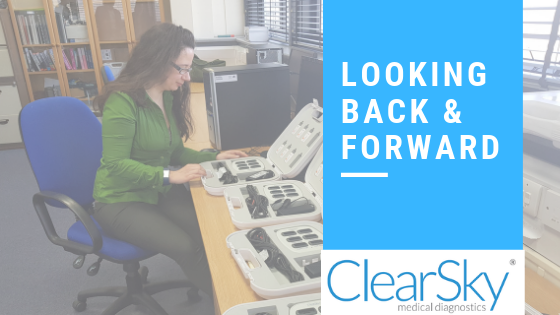 Looking back at some of ClearSky Medical Diagnostics’ achievements over the past 12 months. Led by Dr. Gao and Professor Chen Shengdi at the Department of Neurology and Institute of Neurology at Ruijin Hospital, a ground-breaking study in China found that PD-Monitor could ‘not only be used to accurately measure different severity of bradykinesia in people with Parkinson’s but also had the potential to differentiate early stage Parkinson’s from normality’ with ‘high accuracy, sensitivity and specificity’. We’re now in the process of adding Bradykinesia as a new feature being measured by LID-Monitor. This will enable the consultant to identify not only when a patient is suffering the side effects of medication (dyskinesia) but also identify when the medication dose is insufficient and the Parkinson’s symptoms are not managed effectively. This holistic view of a patient’s symptoms will further enhance medication management and should help to improve the patient’s quality of life. ClearSky’s PD-Monitor has been used in a number of clinical studies, including a nationwide study to investigate whether statins are effective in slowing the progress of Parkinson’s. The study, called PD-STAT, is taking place at 23 NHS hospitals across the UK and is led by the Peninsula Clinical Trials Unit at Plymouth University and sponsored by Plymouth Hospitals NHS Trust. In July, ClearSky MD was part of an award-winning team that scooped top prize in the Human-Competitive Awards (Humies) 2018 in Japan, collecting a GOLD Award and $5,000 prize. The Humies Awards recognise work that solves problems via techniques from evolutionary computation with a solution that is demonstrably human-competitive. For the third year of ClearSky attending the MDS Congress, in Hong Kong this year, we continued to attract recognition for our work with medical centres worldwide. There was substantial interest for our Bradykinesia measurement. LID-Monitor has been used in more hospitals across Yorkshire, including Leeds, Harrogate, York and Scarborough. The accuracy of the data means clinical staff have much more refined information with which to make decisions when adjusting medication. In December, we held an organised workshop with our clinical partners from Leeds General Infirmary to understand the priorities for people with Parkinson’s and indications of introducing new products.